Belgium coach Roberto Martinez says midfielder Kevin De Bruyne is such a talented footballer he could play him virtually anywhere and he'd excel. It's not yet clear what role De Bruyne will play for Belgium against a highly fancied France team in Tuesday's World Cup semifinal. Martinez is just grateful he has one of the English Premier League's standout players in his squad. Martinez says, "It's essential to have a player like Kevin — that he can play different roles." He adds that, "apart from goalkeeper I could tell you that he could not just play, he could perform at the highest level in any position. That's the quality that he has." The Manchester City midfielder had a relatively quiet start to the tournament — by his high standards — playing a deeper and more defensive role than he occupies at club level but was at his best in the quarterfinals. Croatia wants to spring a surprise on England goalkeeper Jordan Pickford during World Cup semifinals. Pickford played just three games for England before the World Cup but has produced some key saves to help his team reach the semifinals for the first time since 1990. Croatia forward Mario Mandzukic notes that Pickford has been doing well at the tournament but says "all members of our team are dangerous for the opponents, so I imagine somebody will find a way to surprise him." Mandzukic dismissed suggestions Croatia would struggle because of playing extra time and being forced into penalty shootouts in its last two knockout games, saying "if we had to play today, we would do it." 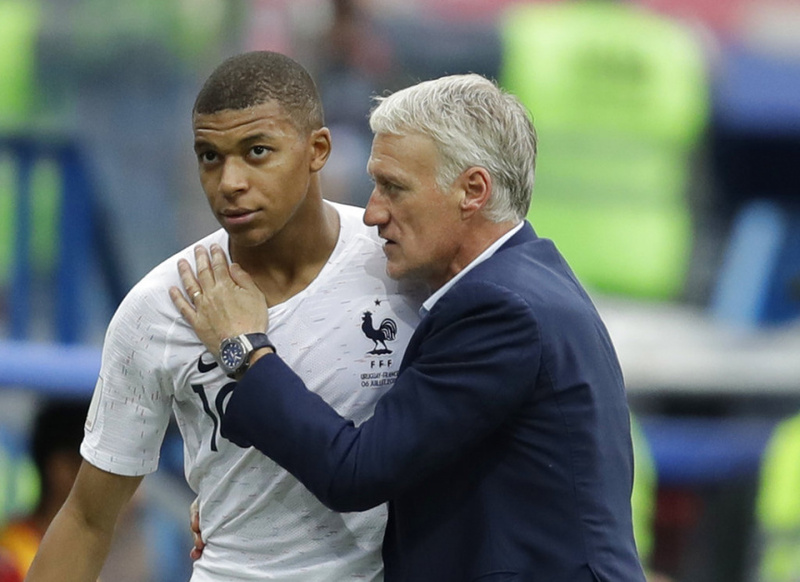 Kylian Mbappe has skipped the start of France's practice session a day ahead of the World Cup semifinal match against Belgium. Mbappe was absent when the squad trained at St. Petersburg Stadium on Monday afternoon. Only the first 15 minutes of the session is open to media and it was unclear if he joined the team once reporters, photographers and camera crews were ushered out. Earlier, France coach Didier Deschamps told a pre-match news conference that four of his players would only have a light training workout, but that all 23 would be fit to play. Mbappe has scored three goals at the World Cup and struck fear into defenses with his electrifying pace. France coach Didier Deschamps was bemused by a question during a news conference on the eve of the World Cup semifinal match against Belgium. A Russian journalist asked Deschamps for his thoughts on the performance on the Russia team, which reached the quarterfinals against most expectations. But Deschamps was only interested in talking about France vs. Belgium. Pressing the translation device against his ear, a startled-looking Deschamps paused and asked the FIFA official sat nearby "are you sure he's asking me this question? I should speak about Russia? Really?" The FIFA official intervened, saying another question should be asked — at which point Deschamps — still sounding baffled — spoke again. "We're on the eve of a (semifinal) match. I've already spoken about Russia. I don't really see the point, whether it's for the French journalists, the foreign journalists, Belgian journalists, or others." Deschamps then added: "Right, let's move on." Goalkeeper Hugo Lloris says his former France teammate Thierry Henry's heart will be torn when Les Bleus take on Belgium in the World Cup World Cup semifinals. Henry is now an assistant to Belgium coach Robert Martinez, and will be helping Belgium try to reach its first World Cup final. But Henry is also France's record scorer with 51 goals, and helped France win the 1998 World Cup and the European Championship two years later. Henry played 123 times for France, retiring from international football after the 2010 World Cup. Lloris, who made his France debut 10 years ago, says "I'm lucky enough to have played alongside (Henry) for two years with France. He was an immense player," Lloris adds, "I think his heart will be divided tomorrow, because above all he is French and he experienced some great times with the France team." Although Lloris, who is set to win his 103rd international cap, says Henry "left his mark on French football," he accepts "he will be doing the most to help his team." England defender Ashley Young says his team could have a "major advantage" in its World Cup semifinal match because Croatia has been taken to a penalty shootout in both of its games in the knockout stage. While England enjoyed a relatively comfortable 2-0 win over Sweden in the quarterfinals on Tuesday, Croatia was taken to extra time and penalties by host nation Russia hours later. Croatia also beat Denmark on penalties after the round of 16 game ended 1-1 after extra time. Young says "I think, especially physically, it's demanding on the body to go 120 minutes. Obviously then you've got to fly back to the base and they've done that twice now. So it could play a major advantage." Young says the World Cup has felt "like a good holiday," such is the camaraderie in the squad, and that England has a "great chance" of being world champions for a second time, after 1966. England and Croatia meet in Moscow on Wednesday. Mark Geiger is among 12 referees still in contention to handle the World Cup final. The American referee previously handled one of the most volatile games in Russia — England beating Colombia in a testy round of 16 game in Moscow. FIFA has announced its list of referees, assistants and video assistant referees (VARs) who have been retained for four games in the final week of the tournament. The list of 12 referees still on duty includes Geiger, Alireza Faghani of Iran, and four from Europe. The remaining four teams in the tournament are from Europe. FIFA has appointed Andres Cunha of Uruguay to handle the first semifinal between France and Belgium on Tuesday in St. Petersburg. Corrected to reflect 12, rather than 10, referees on the list. Croatia has kicked ex-player Ognjen Vukojevic out of its World Cup delegation after he made a pro-Ukraine video with defender Domagoj Vida. The Croatian Football Federation apologized to the Russian public for the video, which was posted after Croatia beat Russia on penalties in the World Cup quarterfinals on Saturday. The video shows Domagoj Vida shouting "glory to Ukraine" before Vukojevic adds "this win is for Dynamo and Ukraine ... go Croatia." Both Vida and Vukojevic previously played for Ukrainian team Dynamo Kiev. FIFA rules bar players from making political gestures at the World Cup and it issued Vida with a formal warning Sunday, but did not impose a match sanction. The Croatian federation says in a statement that Vukojevic had been with the team as an observer but his World Cup credentials have now been withdrawn. Former Barcelona coach Luis Enrique has been hired as head coach of Spain's national team. Spain's World Cup preparations were thrown into turmoil days before the tournament when Julen Lopetegui was fired for accepting the job at Real Madrid without consulting with the national federation. Fernando Hierro took over as interim coach for the World Cup, where Spain had two draws and a win in the group stage before being knocked out in the round of 16 by Russia. The federation announced the appointment of 47-year-old Enrique on a two-year contract on Monday, a day after confirming Hierro had left the team. Spanish federation president Luis Rubiales says "The decision has been unanimous," on Enrique. "I like his commitment. He has let better financial opportunities pass in order to be national team coach." Enrique played for Real Madrid before moving to Barcelona in 1996, where he won two Liga crowns and became the captain before retiring in 2004. As a coach, he spent time at Roma in 2011-12 before moving to Celta Vigo and then replacing Gerardo Martino in 2014 at Barcelona, where he won nine of a possible 13 titles in his three years in charge.